Sorbitol is the largest-volume sugar alcohol. Because of its sweet taste, it is widely used as a partial replacement for sucrose (table sugar) in sugar-free foods, chewing gums, and candies. In all applications, demand for sorbitol is largely a function of its unique combination of functional properties as a humectant, sweetener, bulking agent, stabilizer, softener, and emulsifier. Use in personal care products (mainly toothpaste), food and confections, and vitamin C production accounted for 80% of world consumption in 2016; these applications will continue to account for about 80% of world demand during the forecast period. Sorbitol is noncariogenic, has only about two-thirds the calories of sugar, and provides a pleasant cooling sensation, all of which lead to its widespread use in personal care and food and confectionary products. Also, its humectant properties preserve moistness in food and personal care products. Food and personal care products—primarily toothpaste—accounted for more than half (55%) of world sorbitol consumption in 2016. These end uses are generally mature in developed nations, where only moderate growth in sorbitol consumption is expected during the forecast period. In contrast, in China, Other Asia, the Middle East, and Africa, sorbitol consumption for food and personal care products will increase at a healthier rate, driven by the expansion of the middle class, increased urbanization, and greater demand for consumer packaged goods such as chewing gum and toothpaste. Sorbitol also serves as a starting material for vitamin C production, which is centered in China. Growth in Chinese consumption of sorbitol for vitamin C production has slowed relative to previous years, in part because export markets for vitamin C are approaching saturation. Future exports of vitamin C are expected to remain relatively stable, but the domestic market has enormous potential. 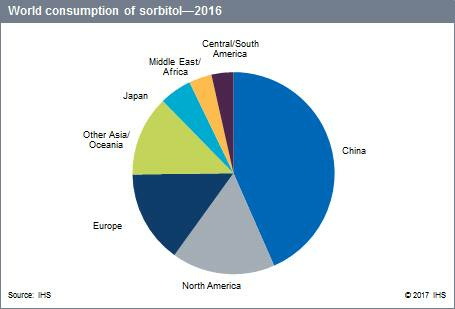 China is the largest single consumer of sorbitol, accounting for over 43% of world consumption in 2016, and for 54% and 46% of world capacity and production, respectively. Vitamin C production was the largest end use, responsible for 50% of Chinese sorbitol consumption in 2016. Chinese production of vitamin C currently accounts for nearly 90% of world output; some 85% of Chinese-produced vitamin C is exported. In addition, there are good opportunities for sorbitol in personal care products, the food industry, and polyethers for polyurethanes. North American consumption of sorbitol will grow at a modest rate of 1.5–2.0% annually during the forecast period. Central and South American sorbitol consumption is expected to grow at an average annual rate of 2.4%. Poor economic conditions in Brazil and Venezuela have restrained consumption growth in recent years; moderate growth is expected during the forecast period. The mature Western European sorbitol market will grow at an average annual rate of 1.4% during 2016–21. In contrast, demand for sorbitol in Central and Eastern Europe is expected to increase at a rate of 3.7% per year, largely as a result of increased use in food and beverages and in personal care products. Sorbitol consumption in Asian countries (excluding China) and Oceania is expected to grow at rates ranging from 0.0% to 3.8% per year during 2016–21. Demand growth in mature Asian markets such as Japan and South Korea will be low to moderate. In contrast, sorbitol consumption is expected to increase by more than 3% per year in developing markets such as India, Indonesia, and Thailand. The global obesity epidemic and the rising incidence of diabetes have not produced a surge in demand for sugar-free products. In most countries, sugar-free foods account for a minor share of any given product category. However, sugar-free chewing gum and breath mints are popular with a wide range of consumers. Global sorbitol consumption is expected to grow at 2.8% per year during 2016–21. This growth will be led by increased use in personal care products, food and confections, and polyethers for polyurethane foams.